Today’s Christian leaders need to listen to people’s stories, try small experiments and join in where new things are developing, says the founder of The Missional Network. Large, mainline church systems are changing -- “unraveling,” says pastor and consultant Alan J. Roxburgh. He spoke to Faith & Leadership about the institutions, structures and stories of the church. The following is an edited transcript. 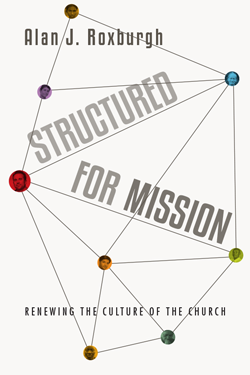 Q: In one of your books, “Structured for Mission,” you use the terms “structures” and “institutions.” Would you start off by defining them as you see them and noting the differences between them? When people talk about the institutional church, that’s, in many, many cases, a kind of signal about something that’s negative. What I was trying to do was to make clear that institutions are always and continually the ways in which, as human beings, we come to form social lives together. You can’t have human life with one another without in some way being institutionalized. That is not a negative term. It is actually a descriptor of who we are as human beings. Structures are the particular ways in which we go about institutionalizing our lives, and structures are primarily the ways in which deeper interpretive meanings of life start to be given concrete form. Q: You also talk about the relationship between story, narrative and structures. What is the connection there? As human beings, we tend to either take on or come to develop, as groups of people, a story about who we are. And that story, in order to be carried forward, in order to have life, has to be shaped inside a structure and given material life. For example, the Passover story, that story which is constitutive of the life and the imagination of Israel and the Scriptures by Jewish people -- the way in which that story is maintained and sustained and given life is inside a structure, and that structure specifically would be the Passover meal that’s celebrated every year. That structuring of life is what becomes a vehicle for carrying forward the critical stories of a people’s identity. We do a similar sort of thing through the Eucharist, in which we structure a way of representing the story of God’s presence in Christ. Q: Given this idea about structures, what are your recommendations for thinking differently about the old institutions? Let’s begin with the local congregation. I work with a lot of them, and what I find interesting is that a lot of the leaders in local congregations are pressed by an anxiety, often, that doesn’t always have clear explanations around it, and their response to that anxiety is to try to bring about some form of change. And what that demonstrates is that these leaders don’t grasp the depth to which the particular story of being churched gets structured in roles, and therefore they keep running into trouble when they try to change something. What they don’t understand is that the more you try to change, let’s say a congregation, its habits and practices, these deeply structured habits have to be engaged in a very different way. I talk about how you listen well within a local congregation. You begin to introduce and invite small experiments around the edge. In those experiments, you practice what, for those listening in practical theology, is called “action reflection.” So those are the directions in which you begin to concretize things. I wrote that book five years ago now, but my observation is that still, in most mainline denominations -- and I’ve worked with almost all of them -- the default actions are actions of how to restructure or create what I call center-out, “hub-spoke” initiatives and responses. And those kinds of actions -- the reactions, restructuring, re-everything -- that come from a center out will never, ever create the kinds of experimenting and the kinds of activities that get at the disruptive changes that are going on in our contexts. You’ve got to be asking the questions, “What are the stories, what are the narratives, what are the ways of life, the habits of life, that these structures represent?” Structures are themselves expressions of more deeply held and engaged stories about what’s important in life. And so any leader, whether at a national or a regional or a local level, has to really begin by paying attention to the actual stories that are shaping the lives of the people that they’re working with. How do you actually begin to live into what’s driving those stories, what’s driving those narratives with that exhaustion, and all that it means and represents? That’s what starts to get you to the places of understanding the shifts and the changes that are taking place, and only as you pay attention to that, and begin to listen intently to what’s happening there, can you begin to suggest some small experiments that begin to give life. And it’s as those experiments begin to develop that people will -- leaders particularly -- begin to discern the kinds of structures that are going to be needed to go forward. In congregations, 95 percent of people actually don’t care about the ecclesiology and the polity and the structural forms. They live in them, in habits, but their concerns and anxieties lay in very different places, and it’s how you begin to attend to those that gives you the clues about how to lead in a changing context. Q: How is the work different for denominational leaders? My own sense is the denominational leaders have really, really tough jobs in front of them. I’m very aware that the amount of time that is consumed in carrying out the regulatory work of the system has not really changed. The truth is, it won’t. That whole approach, the rewriting and reforming, actually misses what’s going on. What has tended to happen, particularly in large mainline systems, is that what I call the unraveling of these systems continues apace. And practically, on the ground, what that means is that there are increasing numbers of congregations that become less and less viable, and when that happens, the level of engagement that either national or midlevel judicatory leaders have to put into trying to manage those unravelings goes up. That produces lots of anxiety, and the issue with anxiety is that the more you’ve got, the more you will go back into your defaults, which are the very last thing that you need to do in the midst of anxiety. They’ve got to step outside of that and begin to learn again how -- and these are going to sound like easy words to use, and I don’t intend them that way -- you’ve got to listen again on the ground. Here’s the good news, and this is where you have to bring a robust theology of hope into the lives of these systems. I have to ask the question, as a Christian inside these systems, “What is God doing here?” And the metaphor that I use is God is unraveling these systems, and in that unraveling, they are simply not going to be put back together the way they were. However, in the midst of that unraveling, what is happening is that God’s spirit is already gestating and fermenting and bubbling in other ways of being God’s people. And therefore, the attention of these leaders -- national and midlevel, etc. -- the attention needs to be on how do we learn to listen and to discern the bubbling and the fermenting of God’s spirit on the ground, in the local. It’s to the extent that these leaders learn how to shift their listening toward that, that they will begin to discover the stories that are starting to ferment on the ground and in the local. And it’s those stories that really become the ways in which these systems will remake themselves. The core challenge within these denominations -- and I’m a member of one of them -- is that the habitus of modernity has gone deep. And what that means is that there remains a continual looking for some kind of manageable, controllable fix that will stop the unraveling and put things back together again. You see it with all the proposals that keep coming up. And that’s the anxiety that continues to drive most clergy and denominational leaders. Q: Where are the places that you find the most hope? They’re amongst people. I’m having supper in one city with a group of people, and they begin to tell me the stories of what they’re doing in their local community. How, as a particular congregation -- this one was in the suburbs -- they decided that they were going to move. They sold their building, and they moved a little closer into the center, and they began to inhabit that neighborhood. I’m talking about young millennials who are building life in the neighborhood together around a worshipping community. And they are beginning to ask the questions of where in that local community are local craftspeople doing and making and creating, and how do they join with it. I could take you to places not far from where I live where numbers of people have said, “Look, I’m done with trying to run this organization called ‘church.’” It’s not that they quit, but they’re starting to put their energy into the streets in which they live and, as Christians, build around some rhythms of life like daily office, and they begin to connect with the people on their street. This is going on all over the place. Because, you see, God’s spirit will just bubble up the kind of healing future that God has.